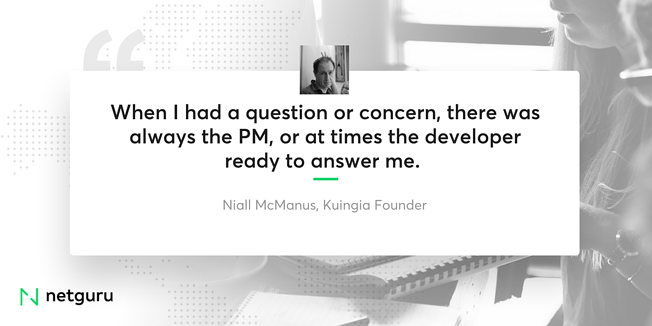 About two years ago, Kuingia’s founder, Niall McManus, needed to collect some information about African markets from many sources: local newspapers, radio stations, research institutes, the OECD and the World Bank. He realized that social media were what all those sources had in common. McManus decided to build a tool that would help leverage the power of social media to collect information and sell it to corporate customers. He was looking for a reliable software development company. A fellow Irish startup founder recommended Netguru. The idea behind Kuingia was to provide to users stories on topics and places they are interested in. Unlike in many Twitter-based apps, the focus was not to follow what is trending at the moment – Kuingia was designed to link reliable news and information to a geographic location. Sourcing information from media in various languages. Finding a strategic tech partner with developer expertise and a willingness to sustain future development. Delivering a minimum viable product (MVP) on a tight budget. Working with many different news languages was the biggest technical challenge. Since Kuingia was designed for serving news on African locations, the search had to be carried out and results displayed in multiple languages. For example, a user looking for information about Algeria needed to access sources in French, English, but also Arabic and Berber. From the business point of view, the cost was the main challenge for Kuingia’s founder. The application needed to be built in a short time due to a tight budget. Designing a lean MVP within the budget constraints. Simplifying the interface to cut costs further. Providing great developer expertise and full accessibility. Providing access to quality scalable design and dev team, which enabled launching an MVP within the budget that addressed the core requirements. Increasing interest from several corporate customers. Laying the groundwork for the next round of financing. The first version of the app has already attracted several corporate clients, who found the solution useful. The clients are blue chips in law, finance, international trade, and ICT. The initial feedback has been positive. Kuingia company is in the process of fundraising, currently meeting its prospective investors. Having a big tech partner – Netguru – is an immense advantage.